Base of Operations: Racine, Wisconsin, U.S.A.
(Dazzler#35 - BTS) - The Racine Ramjets beat the L.A. Bombers for the championship cup in a roller derby. 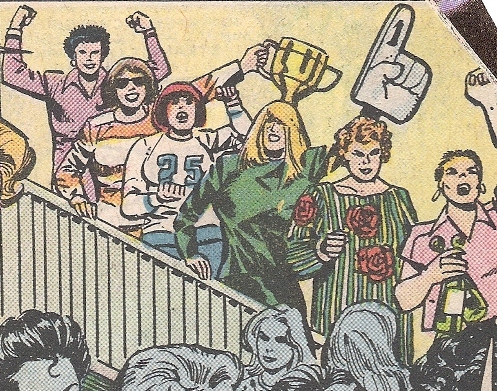 (Dazzler#35) - After winning the roller derby championship, the Racine Ramjets showed up at Femmes to celebrate their victory and physically forced a group of women from their table. They proceeded to order drinks from the waitress, Alison Blaire, who returned shortly thereafter. Beefee ordered a Cutty Sark whiskey, but found out it was a Vat 69 and became angry and poured the drink over Alison Blaire's head and laughed. Alison Blaire was then replaced by Spoonsize, another waitress, who was in turn severely humiliated. Gazelle stuck her foot out and tripped her, causing the drink tray to crash to the ground and spilling its contents. As Spoonsize tried to get up, Gazelle rolled up a towel and whipped her behind. After returning to the table, Beefee grabbed Spoonsize from the back and placed her on the table to demonstrate how she put Cindi "Gibraltar" La Rocca of the L.A Bombers up on a rail and performed the "Ramjet Whammy" on her. Alison Blaire stepped in, saying that's enough and to leave her alone. Beefee then mockingly picked Spoonsize up and threw her into Alison Blaire, knocking both to the floor and laughed. When the two waitresses got up to walk away, the enraged Beefee jumped Alison from behind and proceeded to wrestle and fight her on the ground. The Ramjets stood up from their seats and a brawl involving the whole bar erupted. 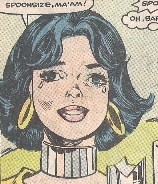 Tex was punched in the face by Alison, but Gazelle grabbed her and while pinning her arms, yelled to Beefee to punch her lights out, but was tossed head first into each other knocking them both out. The police were called but did not take the matter serious that a fight was taking place in a women's bar and did not come. All the members of the Ramjets appeared to have been knocked out and lay strewn about on the floor of Femmes. Comments: Created by Jim Shooter (writer), Frank Springer (pencils) & Vince Colletta (inks). 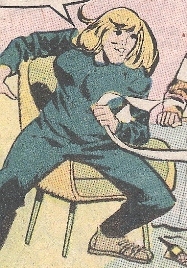 Hilda's last name and additional historical info were revealed in Marvel Atlas#1. Beefee was a strong member of the Ramjets who was extremely violent and verbally abusive. She tried to assault Alison Blair but was knocked unconscious when Gazelle was tossed into her. 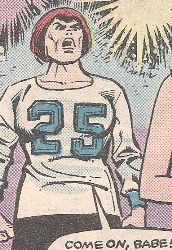 She may have been the Ramjets leader but this is unconfirmed. Gazelle was a member who was probably nicknamed after the African grazing animal because of her speed and agility. She held Alison Blair as Beefee was about to hit her, but was tossed head first into the on-rushing team mate. She appeared to have a cast on her lower left arm, which may have been broken recently - maybe during the roller derby championship match or sometime before that. Inline speed skating champion Hilda was headhunted by America's roller derby team Racine Ramjets. She was a strong woman who spoke English with a strong German or Austrian accent. She stuck her foot out and tripped Spoonsize up. She rolled up a towel and whipped her when she was trying to get up off the floor. 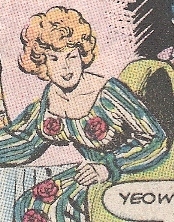 "Rosie" wore a matching rose floral shirt and pants. She did not do anything memorable in the story, but did end up fighting Alison Blaire and the patrons of Femmes. No name was actually given to her in the story so she is named here for her appearance. 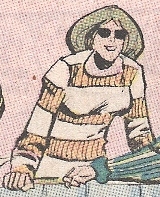 "Shades" wore sunglasses and did not do anything memorable in the story, but did end up fighting Alison Blaire and the patrons of Femmes. No name was actually given to her in the story so she is named here for her appearance. Tex spoke with a southern accent and probably hailed from Texas (hence the nickname). She complained a lot about the service and the type of music being played at Femmes, which, in her opinion, should have been country and western. Barb Spooner was a waitress at Femmes who befriended Alison Blaire and was given the nickname of "Spoonsize" due to her short and petite stature. 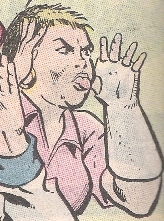 She was bullied by the Racine Ramjets and was too timid to fight back when they verbally and physically assaulted her. Alison Blaire stepped in to defend her from being picked on by the Ramjets. She learned the lesson that people should be treated like people and not because they may look or act differently than what others may think or see without knowing the parts that make us all human. 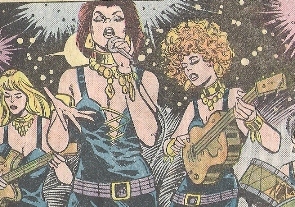 They were a musical band that performed at Femmes women's nightclub and were verbally accosted about not playing the right kind of music that the Racine Ramjets wanted to hear. When the bar erupted into a brawl, Jan Jackson leaped from the stage to break some roller derby girls' faces. According to Alison Blaire, they were a good band and she liked their music. All other characters mentioned or pictured are � and � 1941-2099 Marvel Characters, Inc. All Rights Reserved.